VIP Dentistry is not just your average dental office. Located in the luxurious Chino Hills, we made sure to craft a detailed and personable website that would capture the very nature of the classy location. VIP Dentistry is run by Dr. David S. Han. Dr. Han has a unique background in both dentistry and gnathology. Put together, Dr. Han is able to provide precise and personalized dental care that all patients deserve. As their name suggests, the patients seen at VIP Dentistry are treated through the most premier and innovative technology there is to offer. We made sure to follow suit in creating a website that would stand above and beyond the competition. To create a sleek design, we operated the layout to feature wide, open space with marginal borders. The homepage is detailed and fancy. The homepage features several calls to actions and invites visitor engagement. The navigation menu features all the additional services that Dr. Han has to offer through the added drop-down elements. We focused the homepage on being a one-stop shop for all incoming visitors. Combine the blended square borders with our personalized logo, and you have designed a blueprint for optimal success. Chino Hills is extremely sleek and sophisticated. We made sure to represent that in our color theme. Our gold and dark blue color scheme helps compliment the variety of services exhibited on the website. The dark gold, in particular, is used in places where there are calls to action. Not only does this engage readers, but also helps create this constant presence of class and luxury. When you combine both the blue and gold, you get a nice contrast in hue, but also a harmonious effect. It is the middle ground that stands between both modernism and luxury. We purposely used a large font on title headings to catch the viewer’s attention. The wide white background compliments the information accordingly. Space is expertly managed throughout the site. The legible font helps establish the borders, frames, and text navigation to ensure that the site is easily approachable. As with the wide array of procedures available at VIP Dentistry, we provided an ample amount of visual images to enhance the text accordingly. There are real-life patient reviews and additional links to various services and treatment options for those just casually cruising through. The last thing you want happening while getting dental work done in Chino Hills is to get hacked. VIP Dentistry has you covered. They have gone out their way to include SSL Security within their website. This means that all your important patient information such as credit cards, phone numbers, and home addresses are encrypted before reaching their secure database. You never have to worry about hackers when it comes to this luxurious dental office. In addition, they also list their certifications and awards on the website as well for additional proof of excellence and training within the field. For this Chino Hills practice, the images portrayed the beauty and emphasized the importance of self-care. 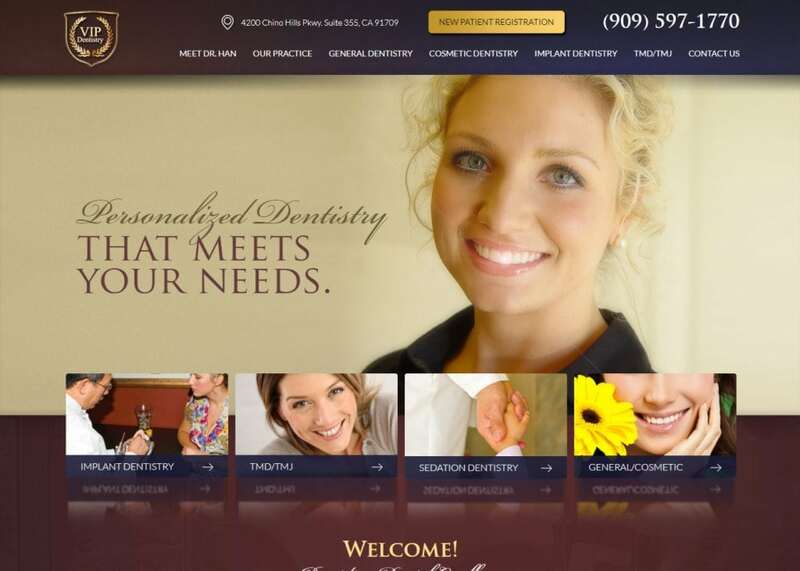 The about me page under our golden navigation menu hosts actual pictures of the dental team. There are also in-depth visuals of the office as well. To help with the check-in process, new patient forms have been provided on the top banner of the website. The bottom and top banners of each web page also carry important contact information always readily available for those in need of cosmetic work.